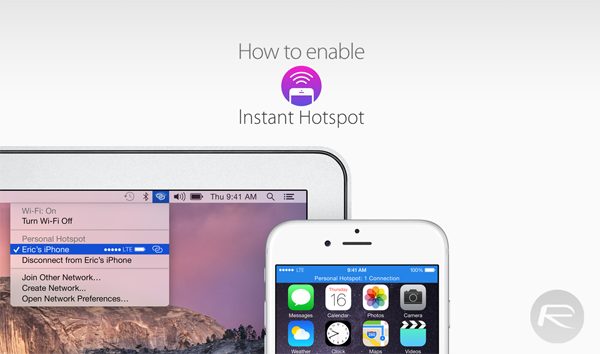 Here’s a complete step by step guide on how to enable and use the Instant Hotspot feature between a Mac running OS X Yosemite and iOS 8.1 running iPhone or iPad. It’s long been possible to enable a Personal Hotspot connection on an iPhone or iPad, depending on the limitations of the network, and then connect a Mac to that hotspot to take advantage of the Internet connection. However, Instant Hotspot, a Continuity feature in Yosemite, makes the whole process a lot more convenient by abstracting away a layer of security and automating the process through the Wi-Fi settings. A shared iCloud account signed in on the mobile device and the Mac handles all relevant security. Enable Wi-Fi and Bluetooth and you’re good to go. If you’re looking to take advantage of the latest Instant Hotspot feature than you’ll need an iPhone or iPad with the latest iOS 8.1 firmware installed. Additionally, you’ll also need a Mac running OS X Yosemite. You will also need to make sure that the data plan on your mobile device is handled by a network that allows Internet hotspot features. At the time of writing, AT&T, Verizon, and T-Mobile in the United States allow this functionality with specific plans. Of course, mileage may vary depending on your individual location and plan. Because security is handled by a common iCloud account, make sure you are signed into the same account on all devices that will be used. 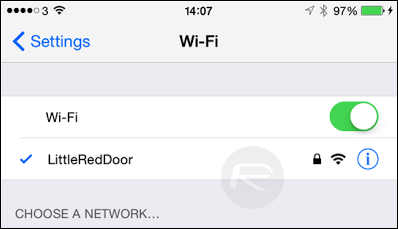 Step 1: Make sure that Wi-Fi is enabled on your iPhone or iPad. This can be activated by navigating to Settings > Wi-Fi. Alternatively, you can also slide Control Center up from the bottom of the display and use the Wi-Fi quick toggle. Additionally, ensure that Wi-Fi is also turned on and ready to use on the Yosemite running Mac being used. Click on the Wi-Fi symbol in the Menu bar and then click on Turn Wi-Fi On. 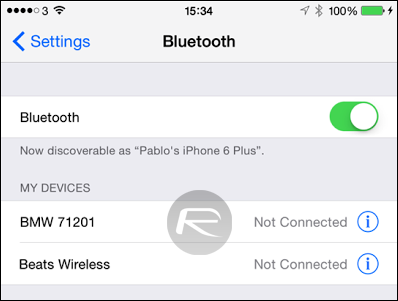 Step 2: Turn on Bluetooth on the iOS device being used by navigating to Settings > Bluetooth. 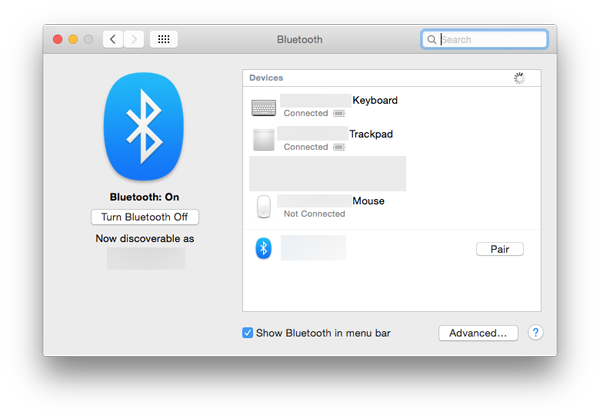 If it isn’t already, also enable Bluetooth on the Mac by heading to System Preferences > Bluetooth > Turn Bluetooth On. Step 3: On the Mac with Yosemite installed, click the Wi-Fi symbol that appears in the Menu Bar. This provides access to available wireless networks and common Internet settings. 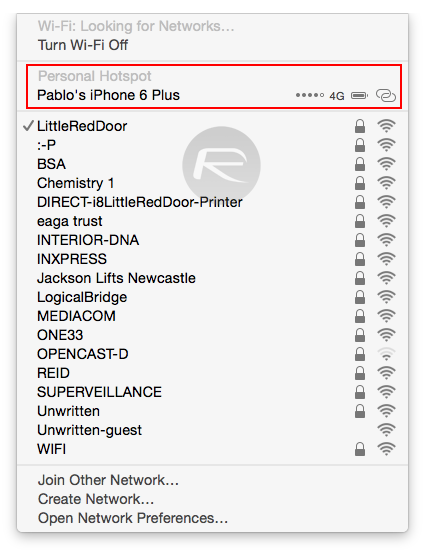 If Bluetooth and Wi-Fi are switched on the iOS device, then a new Personal Hotspot will appear outlining the name of the device that it has recognized. 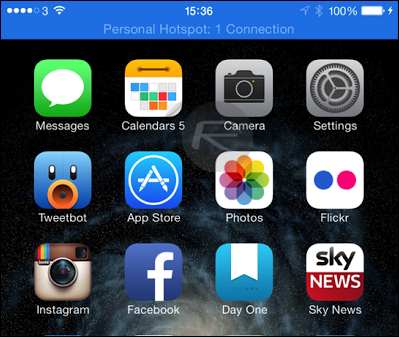 Step 4: The iPhone or iPad that is broadcasting the hotspot will now indicate a successful connection with a “Personal Hotspot: 1 Connection” blue bar across the top of the device. Step 5: You should now be able to surf the Internet on the Yosemite running Mac by utilizing the broadcasted Internet connection from the iOS device. Unfortunately this does not work as described. Just google this topic with “not working” at the end and you will see a string of posts from unhappy people. Doesn’t work for me as well. My iPhone and iPad never show up on the list as Personal Hotspots unless I enable the Personal Hotspot manually on the device. This is the exact behavior I see every time I try to use this option. Some times I would see my iPhone, some times I would see my iPad. No rime or reason why would bot not show in the same time, or not show at all. I’ve tried all of the suggestions that you can find out there from other people, but none of them work as “magically” as Apple showed them in the demo. I consider this option as not ready for prime time yet. There are MANY other issues with Yosemite OS X too. VPN issues, battery issues on MacBook Pro Retina, etc….list is getting kind-a long. I hope Apple pays attention to the online community and fixes this…cuz…I would hate to think that I have to go back and use “the other crap” that is out there so I can get my work done, even if I have to use it as a guest VM on the Mac……. I don’t understand how this is any different than Personal Hotspot on previous versions of iOS and OS. Personal Hotspot has been around for a while, and it’s always connected just like this. How is the Yosemite version any different? I still have to go into Settings on my iPhone every time I want to use it and ensure the Personal Hotspot screen is showing before it’ll be recognized in my Mac’s wifi list. I was under the impression the ‘instant’ part to the Yosemite version meant I wouldn’t have to manually go to the Personal Hotspot screen on my phone and subsequently find it in my wifi list every single time. I still do, though, so I’m curious how this is considered any different than previous versions. Sign out of and then back into iCloud on your iPhone each time this happens. I have to do this almost every day. I have a 5s with 8.1.1 and a 2014 Air with Yosemite 10.10.1 on it. Really annoying!!! For people using AT&T, if you wish to սոⅼοсking any AT&T devices and should not get it done through AT&T, you are able to always go to just google atttiphoneuunloockiing, oahu is the site I have already been using for սոⅼοсking mine and my friends’phones, also the fastest ՍΝᏞΟᏟΚing site I have ever use, we are able to ՍΝᏞΟᏟΚing the modern 6S and 6C as well.